Is it sweater weather yet where you live? Fall is our favorite time of year, and while we don’t get the extreme Winters here in Florida that I once loved growing up in Chicago (and Lori growing up in Boston), it does get a bit chilly here in Central Florida. The leaves have changed colors, our bodies are adjusting to daylight savings time (hopefully), and our favorite fall flavors are everywhere in the things we eat and drink. Seasonal limited editions are a big hit every year, and coffee liqueur giant Kahlua is never one to be left out of the fun. In 2010 we saw the release of Kahlua Peppermint Mocha, a huge hit around my house, and they followed that up with Kahlua Cinnamon Spice in 2011. In 2012, Kahlua Gingerbread hit the shelves, and now they’re back in the holiday spirits in 2013 with the release of Kahlua Pumpkin Spice. First Impression: When it ain’t broke, you don’t fix it. Kahlua Pumpkin comes with the signature Kahlua bottle, with a new label highlighting its flavor, and seasonal availability. On the nose it’s pretty inviting. That familiar coffee aroma is slightly overpowered by pumpkin, cinnamon, and brown sugar. 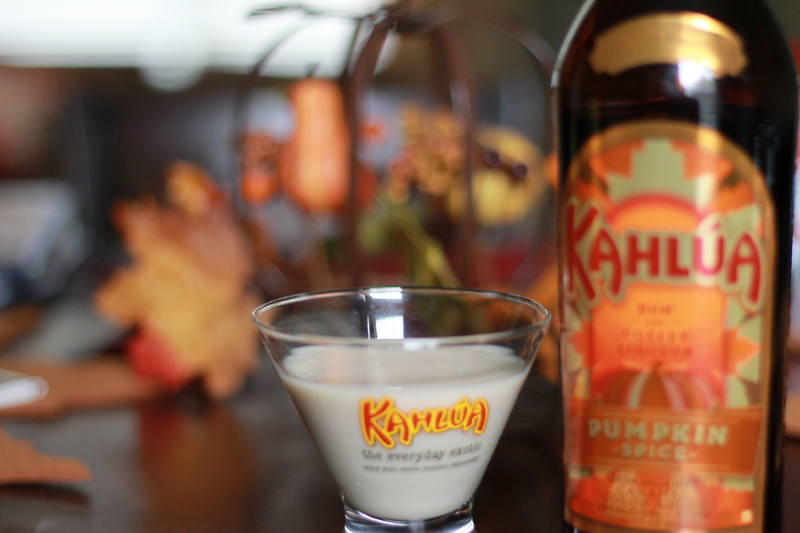 Review: Kahlua Pumpkin is by far our favorite of the limited edition seasonal releases from Kahlua. The Pumpkin flavor is very complimentary to the Arabic coffee and sugar cane rum blend, without being too over powering. One problem I had with previous flavors were if you weren’t an absolute fan of the gingerbread, peppermint, or cinnamon flavors, you weren’t going to tolerate that liqueur very long. They were overwhelmingly flavorful. With Kahlua Pumpkin the pumpkin itself is there, but not overly sweet. It’s the perfect balance, and at 40 proof, its perfect for all levels of drinkers. Overall: This is by far my favorite release from Kahlua over the past decade, and It wouldn’t be a stretch to say it’s in my top 10 releases of any liqueur brand over that same time span. I generally only drink Kahlua three ways: on the rocks, in my coffee, and in White Russians. While it’s always been a versatile spirit, this new flavor has inspired me to use it in so much more this holiday season, and not just exclusively in drinks. Over ice cream, in cake/pie recipes, the possibilities are pretty much endless. If you’re wondering where to find Kahlua Pumpkin spice, be sure to visit Kahlua.com and check for the closest retailer near you. Don’t forget, it’s a limited edition run and the holiday season is midway through so hurry up and grab a bottle (or two) before they run out. If you’re like me, you’ll want to grab an extra bottle to last you past December.If you’re looking for a few Kahlua Pumpkin Spice recipes, check back with us later this week as we share several. For now, here’s one below to hold you over a few days. Combine ingredients in a cocktail shaker with ice, shake and strain into a chilled martini glass.